A mother-of-three feared she'd end up on the streets after allegedly being told her benefits would stop. 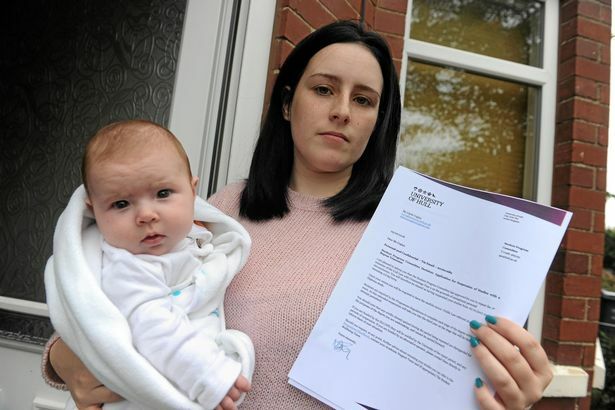 Lilyth Coglan - who gave birth to her youngest child just three months ago - says she has been sent three letters from Hull City Council informing her the authority would be stopping her housing benefits. The 23-year-old said she has been living with the stress of potentially becoming homeless. Miss Coglan has recently had to quit her degree at the University of Hull after complications with her pregnancy and a traumatic birth. Because she is classed as a "suspended student", she is entitled to housing benefits. But the council has since sent her letters saying that because she is in education, her benefits - which she relies on to pay the rent - will be stopped, she claims. Miss Coglan, who is also mum to a three-year-old and a seven-year-old, said without the payments, her family could end up on the streets. The council says it has investigated the issue and say that payment is now in place as normal. Miss Coglan told the Hull Daily Mail : "I have given the council evidence on many occasions from my university of my situation and my entitlement to housing benefit, but they keep contacting me to say they are stopping our money. "I've recently had an operation to have my gall bladder removed and only gave birth three months ago, so I'm meant to be at home recovering and bringing up my baby and children, but I'm having to live with the stress of potentially becoming homeless. "I'm being made to feel like I'm doing something wrong by claiming the housing benefit even though I'm fully entitled to it and desperately need it. "I will be able to give back when I go back to university and pass my course, but I'm made to feel awful. "I'm meant to be having the year off just being a mum and recovering from my operation but I just feel like I'm battling with the council to keep my family off the streets." Miss Coglan lives with her partner who is currently struggling to find work and suffers from anxiety and depression. To prove that her studies are suspended until next year, Miss Coglan has been forced to visit the council office on each occasion they have stopped her payments, she claims. "Every time I have to go in to the council, I get interrogated about my situation," she said. "I don't feel like I should have to explain to them why I suspended my studies, as the letter from my university that I've shown them many times should be enough. "I'm running out of steam going back and forth with them and I don't know where to turn anymore. "Even though they have the letter of proof, I had to go in to the council the other day just to be told that I needed to go home and write a letter to declare that I'm not currently studying and then come back in again with it. "Why I couldn't just stay there and write it is beyond me. What they are doing is not good enough and it is just unethical to be treated this way." The young mum fears that if she misses any rent payments, her landlord could use this as a reason to evict her from the property sooner than planned. "We have a section 21 notice in place on us at the moment as the landlord wants possession of his property back, so we are having to find somewhere else to live," she said. "I'm worried that if the rent is late or missed due to issues with our payments, this could be used as a reason to be forced out sooner than agreed, and we literally have nowhere else to go. "What has happened is putting a real strain on our family and I try not to show how I'm feeling to my kids, but I can't go on like this much longer." A spokesman from the authority said: "The council made a check on the status of the resident regarding ongoing benefit entitlement. The query regarding benefit has been answered and so payment is in place as normal. "Residents are urged to contact the council directly on 300300 to resolve any concerns they may have."